Zhongwei Gu is a Professor of Polymer Science at Sichuan University. He has been appointed as a Chief Scientist of the National Basic Research Program of China (the 973 Program) for three five-year periods since 1999. He graduated from Peking University, was a senior visiting scholar at the Research Triangle Institute of RTP funded by the World Health Organization (WHO) from 1984 to 1986, and joined Professor Kopecek_Ñés Lab as a research fellow in University of Utah from 1991 to 1993. After serving as a Professor (1994) and a deputy director/director of the National Research Institute for Family Planning (NRIFP) in Beijing from 1995 to 2005, he moved to Sichuan University and served as a director of the National Engineering Research Center for Biomaterials and the Engineering Research Center in Biomaterials of Sichuan University (2005-2015), the National International Science and Technology Cooperation Base for Biomaterials (since 2009), and a Chief Scientist of the Biomedical Engineering and Technological Innovative Program (the 985 Project of the State Education Ministry) for two five-year periods since 2005. 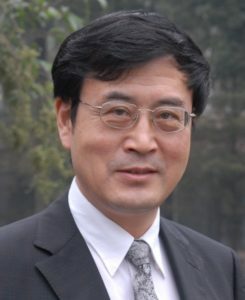 He has been elected as a vice chairman and secretary general of the Chinese Committee for Biomaterials (2000-2012), vice president of the Chinese Society for Biomaterials (2012-2015), and is an executive member of the council of the Chinese Materials Research Society (C-MRS), the Chinese Society for Biomedical Engineering (CSBME), the Chinese Society for Biomaterials (CSBM), a director-general of Sub-Society for Biomedical Polymer Materials of CSBM and director-general of Sichuan Society for Biomedical Engineering. He has been the Experts Committee of numerous academic institutions and organisations such as National Natural Science Foundation of China, National Drug Evaluation Committee, National Standardization Technical Committee of Surgical Implants and Orthopedic Devices, and State Key Laboratory of Molecular Engineering of Ploymers (Fudan University), National Engineering Research Center for Nanomedicine (Huazhong University of Science and Technology). He has awarded numerous awards, including the Fellow of the International Union of Societies for Biomaterials Science and Engineering (FBSE) in 2004, the Distinguished Visiting Fellowship Award of the Royal Academy of Engineering, the First Award in Natural Science by China’s Ministry of Education. He was also praised for making an important contribution to the National Medium and Long-Term Science and Technology Development Planning Strategy Research. He currently serves as Editorial Advisory Board of Macromolecules and ACS Macro Letters, Protein & Peptide Letters, and Editorial Board Member of J Biomaterials Sci-Polym Ed., Biomed. Mater., Prog. Nat. Sci.-Mater., etc. His current research activities focus on the molecular design and controlled preparation of novel biomedical polymers (especially polymeric dendrimers), self-assembled biomaterials and nanobiomaterials, bioinspired and biomimetic systems for drug/gene delivery and molecular diagnosis, biomaterials for tissue engineering. He has published over 300 peer-reviewed scientific manuscripts and composes/translates ~15 books and chapters, holds more than 30 issued patents, and has numerous international and domestic conference presentations including plenary/keynote/invited lectures.